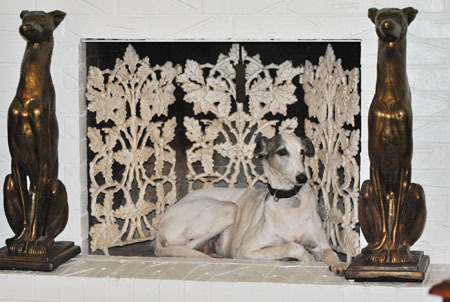 Senior greyhounds are always welcome to join our family, sometimes three at a time. Ralph and his two brothers, Eurie (GALT's Ernie) and Mikie (GALT's Mike) moved into our hearts in May 2013. They were owner releases from a hoarding situation and had been kept in close quarters together for 10 years. Needless to say they were very much bonded. When separated for any reason they cried, complained and were just pitiful. They had finally grown confident and comfortable at our home so that they didn't have to sleep all three piled on one dog bed sardine style. Although on the rare occasion they were apart at home it was obvious they always knew where the other two were. They were a team, eating, sleeping and playing together. And they LOVED to run and play, in fact they only have one speed, fast, outback and then zooming back inside thru the very abused recently replaced doggie door. I got up early this morning to get on the treadmill and Ralph met me. I gave his cauliflower ear a rub and noticed he had a high temp. I called for Lonnie and Ralph collapsed. We rushed him to Animal Medical Center in Amarillo. Ralph had suffered a stroke and the seizure he had couldn't be stopped. Ralph went ahead of his brothers to the bridge. He was always the most daring and curious of the three. No matter how long we have these seniors it is never long enough. We enjoyed Ralph's antics and his unconditional love and hope he enjoyed his time here with us. Thank you Greyhound Adoption League of Texas, Inc. for taking these three seniors in and trusting us with their precious lives. Five months with Ralph, could never never be long enough, he gave us so much in return for a simple warm bed, ear rub and a full dinner bowl. Godspeed Ralph, you will be greytly missed as you were loved.